Beautiful unissued specimen certificate from the West End Electronic Company dated 1898. This historic document was printed by the Siebeling Bros. Company and has an ornate border around it with a vignette of allegorical figures holding electric bolts. 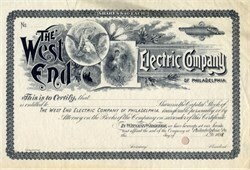 The West End Electric Company later became the Philadelphia Electric Company, a regulated public utility.